Week 39 – Is it time to prune your life? It’s tree-pruning time in New England and I recently spent an afternoon with Jim, our gardener, learning about how to support the trees we’ve planted in our yard. As it turns out, the care and nurturing of trees can teach us a few things about the care and nurturing of our lives. When Jim and I began our work together, he explained that to assist the growth and health of a tree, he’d use a three-stage pruning process. First, he would remove any dead branches. Second, he would focus on the interior of the tree and cut out any branches that were alive but growing sideways into the stronger, well-directed ones. This would open the tree to more light and allow it to flourish. Finally, he would carefully remove some of the healthy branches to shape and enhance the natural beauty of the tree. As I listened to Jim, I thought about how we can use this same process to support our own growth and maturity, too. First we need to let go of what no longer holds aliveness and vitality. This could mean removing clutter, releasing things we no longer need or use, leaving a dead-end job, and even saying goodbye to relationships that have run their course. This part of the pruning process is a little easier to see because, if we’re honest with ourselves, we usually have a sense of what needs to go. It’s the next stage that can prove challenging. We only have a finite amount of time here on the planet and it becomes far more valuable as we get older. Midlife has forced me to think long and hard about what gets my time and attention, for example. If I want to put more energy into my writing, my meditation practice, or my cherished relationships, I can’t spread myself thin anymore. This has required me to let go of things I want, but no longer have room for in my life. Sometimes I have to say no to getting together with people I care about and would like to see. Or, I have to turn down opportunities and invitations that seem interesting or exciting. At this stage, I’m more enamored with living deeply, and vertical living requires time and space. The last stage of pruning – removing a few carefully chosen branches to improve the look of the tree – has to do with the art of refinement. These days I want to live and work in an environment that I consider beautiful which usually means simple, spacious, and adorned with a few carefully chosen objects of affection. This requires a bolder level of letting go. I’ve been giving away the things I love – favorite keepsakes or family heirlooms, for instance, to people I love. Less is becoming so much more. If you feel compelled to open your life to more light and growth, you may want to take Jim’s advice and do a little pruning yourself. Will it feel scary? Yes. Do you risk hurting people? Absolutely. Is it going to be hard sometimes? Without a doubt. Commitments that leave you tired and uninspired, relationships that have met their end, and “stuff” that pins you to an emotionally cluttered life won’t promote aliveness. Allow your own kind of beauty to matter. 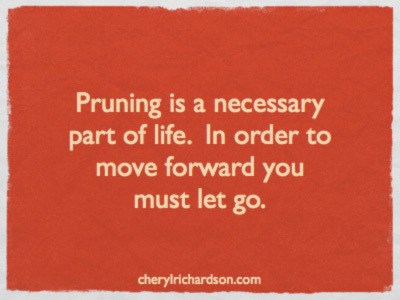 Yes, pruning is good for the soul.